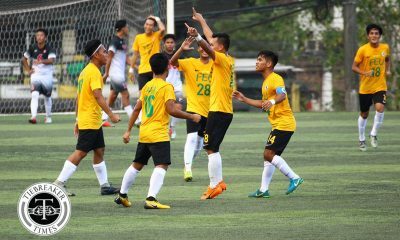 Knowing of the high stakes this game had, the De La Salle University Green Archers shoot down the hungry National University Bulldogs, 2-1, to zoom to third place ahead of idle UST Golden Booters, Thursday morning at the Rizal Memorial Stadium. 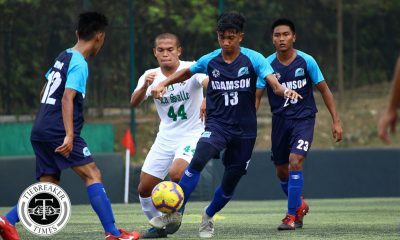 With the two protagonists known for their pressing game, it was a surprise for the Green and White to sit back on defense at the start of the match, and allowed the Bulldogs to try and pierce through. 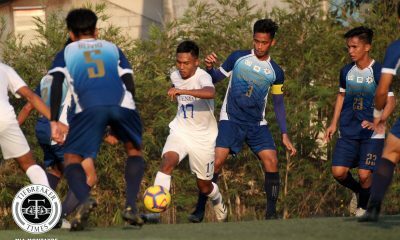 Nonetheless, the Sampaloc-based squad could not navigate past the disciplined defense of the opposition. That fortress even plucked the opening goal. At the 11th minute, a perfectly timed clearance found Mathew Custodio on the right flank. The winger brought the ball into the box before sending it to Cristian Zubiri for the finish. The Bulldogs did not let up on offense however and continually searched for their own point on the scoreboard. The frequent attempts led to free kicks, only the ball went over on those occasions. 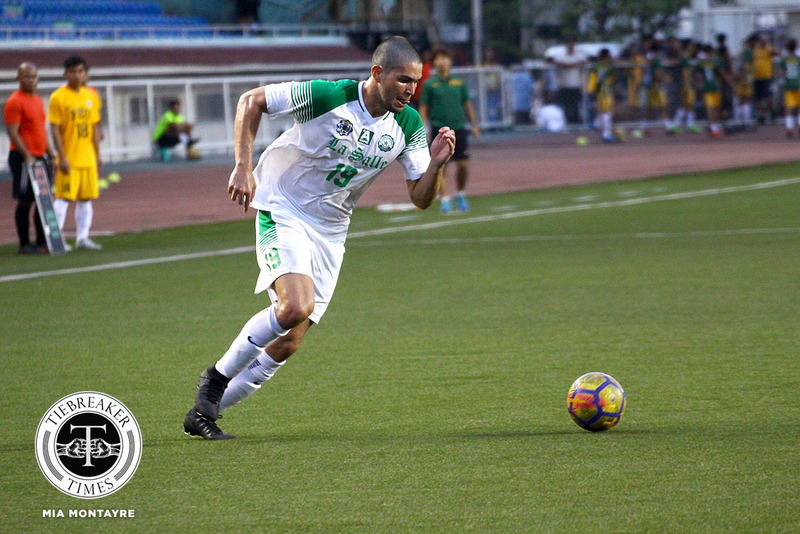 The equalizer was bound to happen and fortunately for NU, it did, with minutes to spare in the first half. Lawrence Colina fired a looper from the right wing, but the ball bounced of the crossbar. 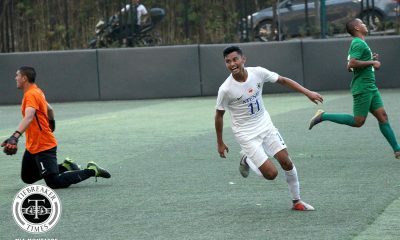 Good thing, Jekar Sullano was at the right place at the right time and hit the back of the net with a spectacular header. The period ended at a stalemate, but one could sense, the match is about to get more interesting. La Salle head coach Hans Smit knew that his players could turn their fortunes around in the second period. He shared, “NU is not playing back four, but back three. And when you are playing flat back four, it’s easy to beat. Moreso if you are playing flat back three. “So, my instruction is to push up, so we could get more rush on attack because the defense will bug down,” he added. 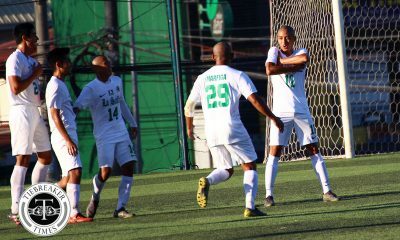 With such change of play, the Taft-based side eventually gained control of the match. And in the 63rd minute, another go-ahead goal was registered. Another timely pass found Custodio, who beat two defenders and sent the ball near the opponent’s goal. From a tight angle and with a defender to shrug off, the forward used the post to deflect the ball into the goal. NU tried their best to get one back again, but conditioning let them down. Cramps and injuries plagued their chances of getting back in the match. Unfortunately, the four minutes of added time was no help and La Salle took home all three points. Both teams continue their road to Final Four on Sunday, April 15 as La Salle (20 points) takes on the UE Red Warriors (16 points) at 3:00pm, while NU (16) battles the UST Golden Booters (19) at 5:00pm. The same Malate venue is the place for the two crucial matches.